If you haven't noticed already, this makes scoping out photos in the Photo Index super simple. After you click a thumbnail image, a medium sized preview of the photo will appear as the background fades to gray. 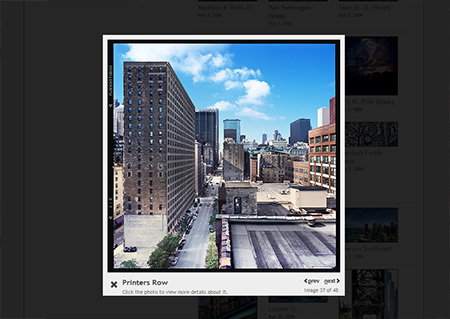 Browse to other images with the Previous / Next buttons in the lower right corner or use the 'p' or 'n' keys on your keyboard. Click directly on the photo to view it in more depth. Click in the gray, outer area to return to the page. Even more exciting is the way AwesomeBox allows us to view large images. There's a new link just below the detail info for each photograph: Enlarge this Photo. Once clicked, the photo will grow to fill the dimensions of your browser's window.